Rowan berries are relished especially by thrushes and other bigger songbirds. 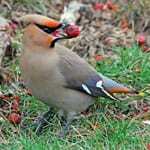 One bird that is very fond of them is the waxwing (Bombycilla garrulus). 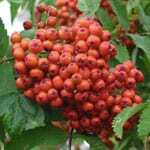 It breeds in Scandinavia but, if rowan berries become scarce in its homeland in winter, it comes in large flocks to the UK and Ireland to feed on Rowan and some other, especially red, fruits. It can eat two or three times its own body weight in a day. Aucuparia means “bird-catching”. Rowan was used in the past to create birdlime used in the unfortunate practice of trapping songbirds for food. Rowan berries are relished especially by thrushes and other bigger songbirds. One bird that is very fond of them is the waxwing (Bombycilla garrulus). It breeds in Scandinavia but, if rowan berries become scarce in its homeland in winter, it comes in large flocks to the UK and Ireland to feed on Rowan and some other, especially red, fruits. It can eat two or three times its own body weight in a day. Shield-bugs relish its berries as well. They are even edible to humans, are rich in vitamin C, but people should be careful of eating it raw in large quantities as it contains parasorbic acid, which is slightly toxic, but breaks down into non-poisonous compound when cooked. 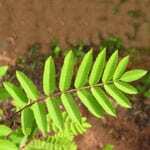 Leaves are composed of 6-8 pairs of small leaflets, each 3-6 cm long and toothed at the edges. They are usually hairless, dark green above and grey-green below. The leaflet at the tip is never larger than the rest. 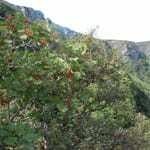 The leaves turn yellow and red in autumn and often stay on the tree into November. Flower heads are creamy white. Each flower has 5 petals – like the flowers of other members of the rose family. They are arranged in flat, branched clusters about 10cm wide, usually. 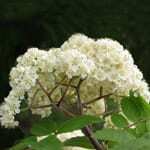 The flowers appear from May to June. They have a very distinct smell that attracts flies, beetles and bees. These help to transfer the pollen from one flower to another. Fruits are almost round, fleshy red berries, up to 10mm across. They are orange at first, with yellow flesh. They ripen in September and each has between 2 and 8 seeds (usually 3 or 4). Each fruit has a tiny “star” in the middle which is a remnant of the calyx and reminds us, that it belongs to the same family as dog rose. Seeds are dispersed by birds, that’s why we sometimes find so-called “flying rowans” in unreachable places, eg. in the crown of another tree, like oak. 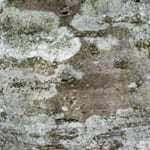 The bark is smooth, shiny and grey. Winter twigs are grey with hairy buds (especially when young). The wood is dense, hard and pale brown. It is used for turnery, carving and is good for firewood. Together with Yew, it was used in Middle Ages for making bows. Rowan is a deciduous tree. It is very frost-hardy, wind resistant and has deep roots, so can grow even in rocky crevices. It tolerates poor, thin, acid soil. Rowan also colonizes bare ground together with birch and grows at a higher altitude than most other deciduous trees. Unlike downy birch, it doesn’t form woodlands on its own and can’t tolerate waterlogged sites.